Forgive my battered library copy…I’ll be buying a better one. 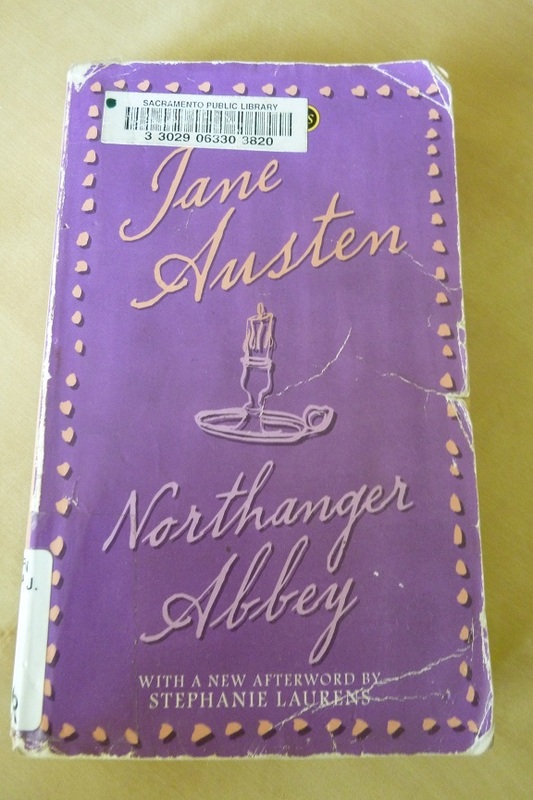 I finally got to my last goal-book for R. I. P. – Northanger Abbey by Jane Austen. There’s even a little more of a “finally” to this, considering it was a chosen book for my high school book club and I never got around to it then. But maybe it’s just as well; I don’t know if I would have found Austen as easy a read then–and I loved the book now. Northanger Abbey is a spoof on gothic novels. I haven’t actually read many, but it doesn’t seem to matter. A lot of the concepts have slipped into the cultural awareness, and it always seemed pretty clear what Jane was poking fun at. The book is about Catherine Morland who, the narrator tells us, doesn’t seem at all suitable to be a heroine–for instance, her father “is not in the least addicted to locking up his daughters.” Catherine loves reading about heroines, and simply adores gothic novels. Her opportunity for adventure comes when she’s invited to accompany some family friends to Bath. There she makes the acquaintance of the charming Mr. Tilney and his sister, who eventually invite her to their family home of Northanger Abbey. It’s the perfect setting for a gothic novel and Catherine’s imagination runs wild. This book has the most delightful feel to it. It’s the lightest Austen I’ve read, with a wonderful sense of humor throughout. It’s frequently meta, with a narrator who comments on the ongoing story, noting at times how it does and doesn’t fit a gothic novel, with some lovely tongue-in-cheek observations. Austen herself feels much more present here than in her other novels that I’ve read. The characters are vivid, and the cast is a little smaller than usual, so the characters don’t get lost among the crowd. Catherine is rather silly at times, but she’s also very honorable and good-hearted. I don’t admire her as much as Elizabeth Bennet, but I like her very much. She shows good character development as well, maturing through the novel. And Mr. Tilney–well, with all due respect to Mr. Darcy, it takes Colin Firth five hours to crack a smile in the BBC miniseries. It’s so nice here to meet an Austen hero with a perpetual smile. Mr. Tilney makes jokes and is charming and fun. I was talking about this book with two friends, and the opinion was unanimous in appreciation of Mr. Tilney. Another note: even though I’m calling him “Mr. Tilney,” the narration actually refers to him as Henry at times, and you can’t imagine how much more human that makes him seem than the perpetual Mr. This and Mr. That we usually see in Austen. The other major characters are Isabella Thorpe and her brother John who…well, I hate to give things away about them. But Catherine learns something about real and imagined intrigue, and the difference between books and life. Which reminds me–there’s a splendid rant from Austen at the end of chapter five, about the poor regard for novels and how wonderful they really are. Bravi. I think I’ll be recommending Northanger Abbey next time I’m talking to someone thinking about picking up Austen. It’s a good gateway book, distinctly Austen but lighter and a less dense read. And my new favorite! P&P is running a close second for me–and if I read it again right now, I even might change my mind. They’re both great! Sound like a fun read, and something different from Austen’s usual novels. It has been many, MANY years since I’ve read this. It was my first Austen, read because of its homage/parody of gothic novels, and I found it to be quite fun. Fun fact: I read this while working at a video arcade. Probably not the kind of book one would expect to find in a video arcade. 🙂 It is a good one and I’m glad you enjoyed it so much.